Part of my justification is that I believe that all media is propaganda at some level. Whether you think propaganda is a good thing or not really just hinges on whether you like the messages you’re getting from your personal selection of media. Another part of my justification is that I believe in the need for human efforts to push out beyond our atmosphere. And I know that doesn’t happen without a sustained and effective PR effort. Which amounts to propaganda. Finally, though, and today, I say that propaganda is a good thing simply because Mars is what it is. Good programming that has multiple agendas. These are threefold. Third, it’s an effective vehicle to promote SpaceX, which I have to believe is underwriting a substantial part of this multi-season production. Elon Musk is featured regularly as a supporting cast member, and even has an alter-ego who swirls at the center of the storyline’s mid-21st Century efforts to colonize the Red Planet. Second, it aims to educate the public about the history of exploration in general, the history of space exploration specifically, and the particular needs of prepping to establish a beachhead on Mars. Part of this education furthers Goal 3, too, as we learn a lot more about SpaceX and its role in this master plan. 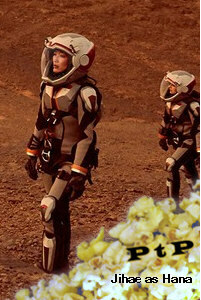 But first, and this is where the Executive Producing Ron Howard and Brian Glazer come in, Mars aims to entertain. And does so in spades. Each hour-long episode cuts back and forth between the fictional 2033-and-beyond Mars mission which successfully launches an outer-space land-and-resources rush and carefully culled footage of the contemporary efforts that lay the supposed groundwork for that mission. Call this duality the SciFi/SciFact effect. I am most impressed by the SciFact’s insistence on avoiding whitewash. Musk and SpaceX are not presented as infallible or irresistibly charismatic. Musk is frank about failures as necessary steps for refining success. We see plenty of SpaceX, NASA, and Soviet rockets blow up. And if anything, Musk’s peers and forerunners come of as more fanatic than Musk himself. And it’s hard not to agree with their passion and logic, while wondering why Musk is clearly less magnetic by comparison. The SciFi story is compelling as well. The initial mission puts six astronauts on Mars, and you–and they–simply know not all of them will make it. The odds are too stacked against them, with life support and energy systems having to be deployed and functional prior to their arrival; with the touchdown actually succeeding, close enough to the target to actually count; with a source of life-sustaining water needing to be located; and a suitable solar-shielded habitat having to be deployed underground. Oh. And the economics dictate that life must be found, or political will / public sentiment might still flag. Tall order? You bet. All of this is addressed in Season One, and given that there’s a Season Two, the outcome of those issues is rather a foregone conclusion, with just a few surprises along the way. Season Two deals with the expansion of the enterprise to include commercial concerns. So much for Eden on the Fourth Rock from the Sun. The most problematic aspect of this production is that it demonstrates how far we still have to go in gender equality. All of the historical figures featured are white men. Virtually all of the contemporary talking heads are men. And as the program starts, the two main movers and shakers of the mission are men: crew Captain Ben Sawyer, and Ed Grann as the Musk equivalent. When the crew establishes a beachhead on Mars, and Commander Hana Seung has obviously taken time to apply copious amounts of eye liner and lip gloss before making her formal reports to mission control, we can kind of tell how the space program will still think of women in 2033 and beyond. And for 2018, I think, “Really?? ?” and am a bit embarrassed for ourselves. By the time Episode 3 of Season One rolls around though, this sexist ship has begun to right itself, as if the producers know you can’t get this propaganda flag flying properly if the winds don’t blow the right way to begin–a storyline theme mirrored in the SciFi portion of the program. And the most recent ads promoting the program play up what “National Geographic is doing for women” with Mars. There’s language involved in all of this, you know. We’re headed to Mars, after all, and not to Venus. There are thousands of years of masculine momentum taking us on this trajectory, and that’s a lot of inertial testosterone to overcome. If you get my drift. The Producers went with almost entirely unknown onscreen talent for this project. The most startling and bold casting decision–an inspiring one, and truly worthy of such visionary propaganda/art–is the casting of pop sensation and motion picture rookie Jihae in the dual roles of twins Hana and Joon Seung. While one rockets to Mars, the other helps guide the mission in administrative and political roles. The further along the story goes, the stronger Jihae’s role and performances get. I don’t think she’ll succeed in turning Mars into the Pink Planet, but it’s a start. Bottom line: Given that what you feed yourself will shape your being, why not feed yourself some programming that gets you outside of yourself and your planet, if only for a little while? Star Trek and Next Generation did that for us. I think it’s high time for Mars. How about you? Season Two of Mars airs Monday nights at 9PM on the National Geographic channel. Episode 2 aired last night. If that channel is not included with your cable package, you can find it with your Hulu subscription. Season One of Mars can be streamed via National Geographic online or Fox.com by logging in to your TV provider (including Hulu). Fox will even let you stream a couple episodes as a guest, if you’re not sure you want to invest in the whole six-hour binge.